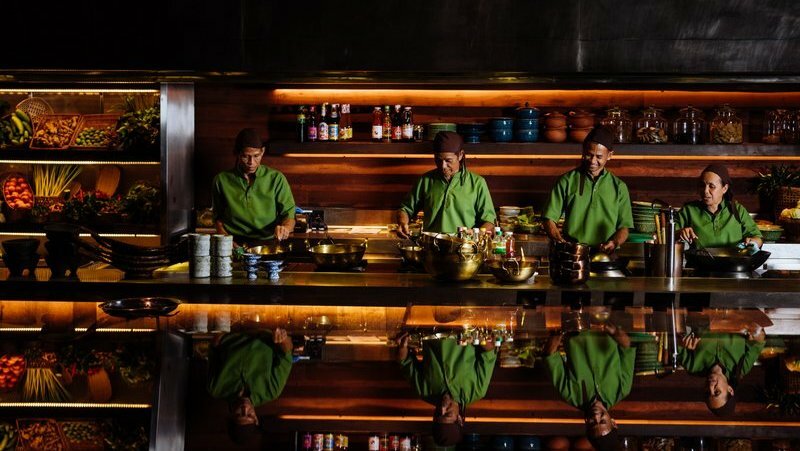 I recently visited Rosewood’s flagship Thai restaurant, Ta Khai, to see first hand how the international brand has taken the plunge into Thailand, given that Phuket is Rosewood’s first hotel to open in the Kingdom. 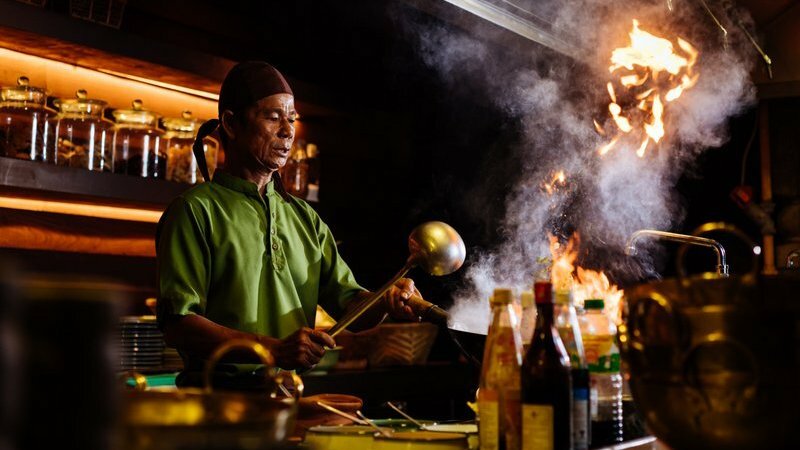 Ta Khai overlooks the serene Tri Trang Beach and sits adjacent to the Rosewood resort at the southern end of Patong. The restaurant has its own roadside entrance (a blessing which allows casual diners easy access) which leads down a set of stairs to a verdant natural amphitheatre that faces the sea at beach level. Ta Khai has been built from the ground up to make the most of this beautiful location and once you are there it feels like you are in a remote island hideaway and quickly forget about the outside world. 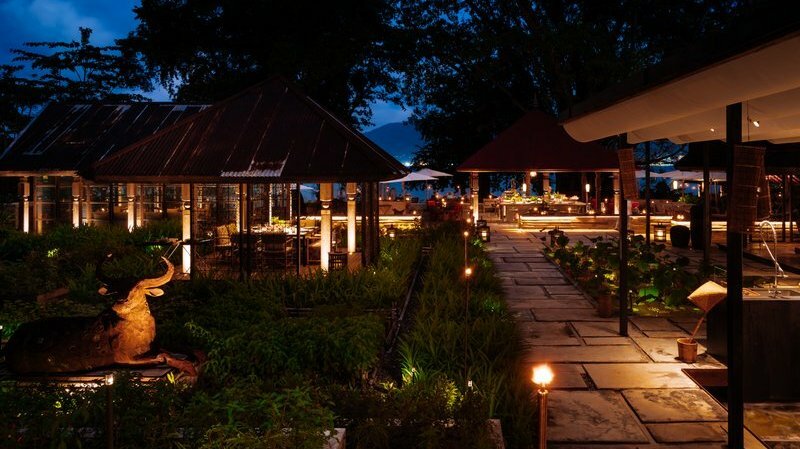 As you enter you walk past a rustic market garden on one side and a fish pond and open-air kitchen on the other. 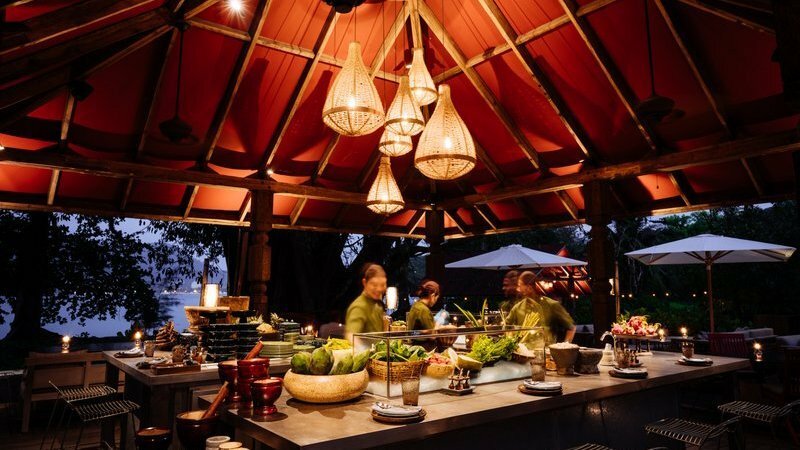 The friendly staff welcomed us and explained that the garden supplies many of the herbs and vegetables used in the kitchen and the pond allows guests to select and net their choice of fish to be cooked and served. As we approached our table the view to the water was dominated by an immense and truly majestic fig tree, its base wrapped in multicoloured fabric in reverence of its beauty and the spirits believed to dwell within. 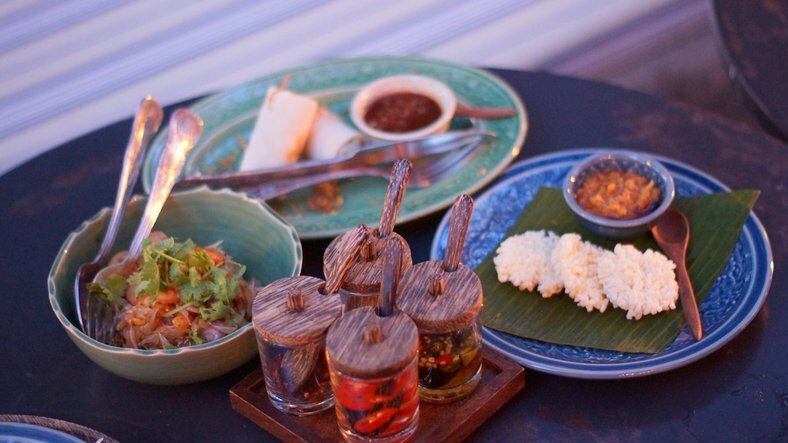 We choose to sit outside and enjoy the warm evening air, but there is also an air-conditioned room made from an old Thai farmer’s barn with its side replaced by huge plates of glass. The wooden fixtures used throughout the restaurant are beautifully weathered and lend a timeless, rustic feel to the place. It truly is a seamless match between the man-made buildings and their natural surroundings. 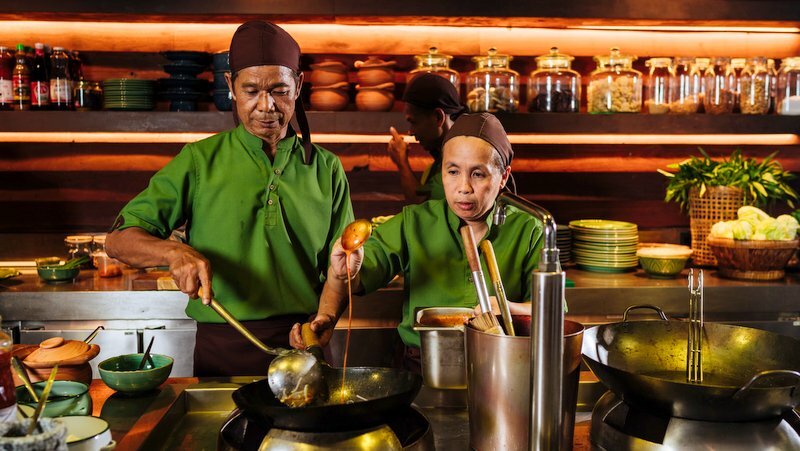 With the authenticity of the surroundings, it would hardly do to have a foreign chef heading up the kitchen, instead Ta Khai has managed to recruit Uncle Nun and Aunt Yai, a married couple from Trang who are both chefs and have honed their culinary skills together over their 30-year union. 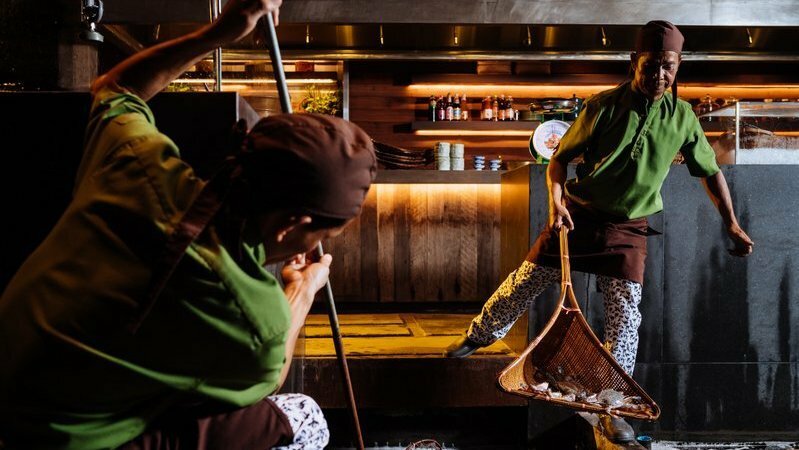 They are both masters of southern Thai cuisine and bring an incredible depth of knowledge and skill to the kitchen at Ta Khai. 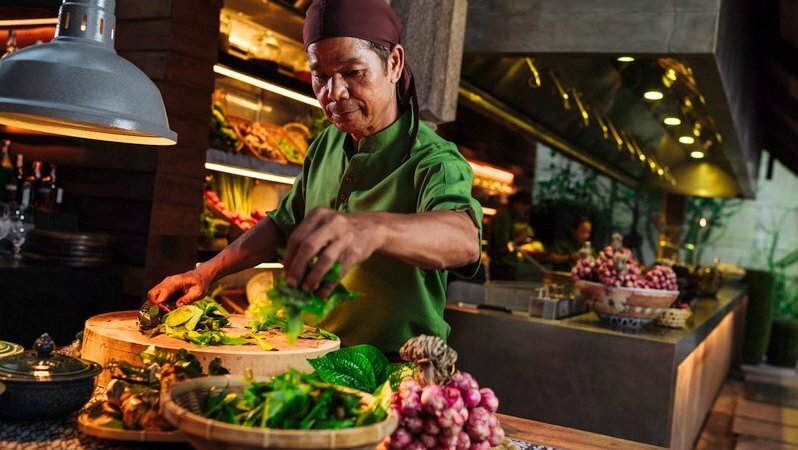 For those who don’t wish to order a la carte there are three set menu options, the third of which is Uncle Nun and Aunt Yai’s recommended dishes, these vary day by day depending on the availability and freshness of ingredients. It was an easy decision to put ourselves in their capable hands and we sat back to enjoy a refreshing drink and take in the view while we waited for our food. 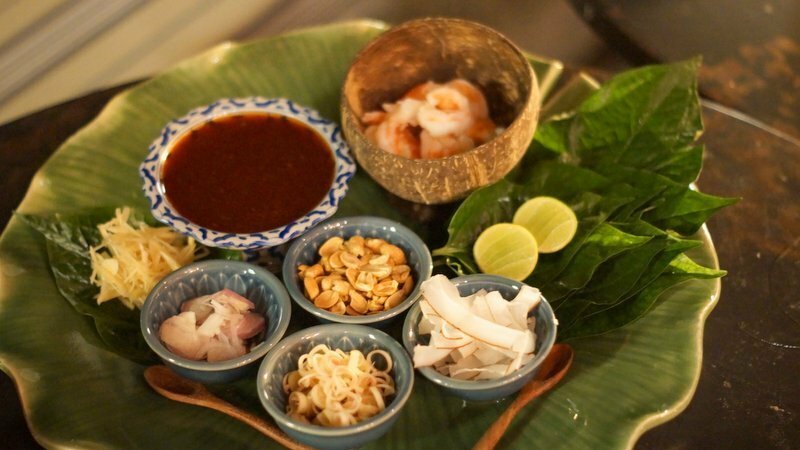 The first dish to arrive is Miang Kham, a kind of do-it-yourself snack made by putting a pinch each of shallots, garlic, ginger, chilli, peanuts and dried shrimp on a chaplu leaf, then drizzling it with sweet tamarind sauce before wrapping it up and popping the whole thing in your mouth. The individual ingredients explode and combine to create an amazing symphony of textures and flavours. At the same time we were served some delicious Poh Pia Sod – fresh Phuket-style spring rolls with a soft wrapper filled with prawns, jicama bean sprouts, chilli and a tamarind dip. 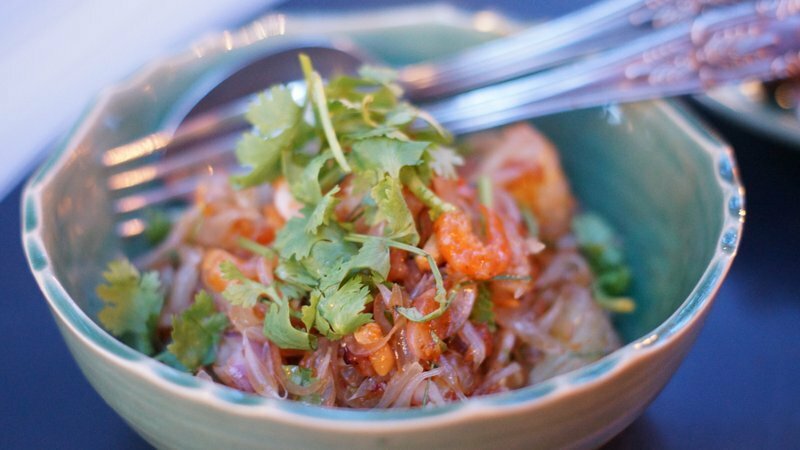 Next up was a vibrant Thai salad called Yum Som-O Goong, which has chunks of pomelo, prawns, peanuts, coconut and crispy shallots mixed together to create a superbly fresh and flavourful dish that was one of my favourites. 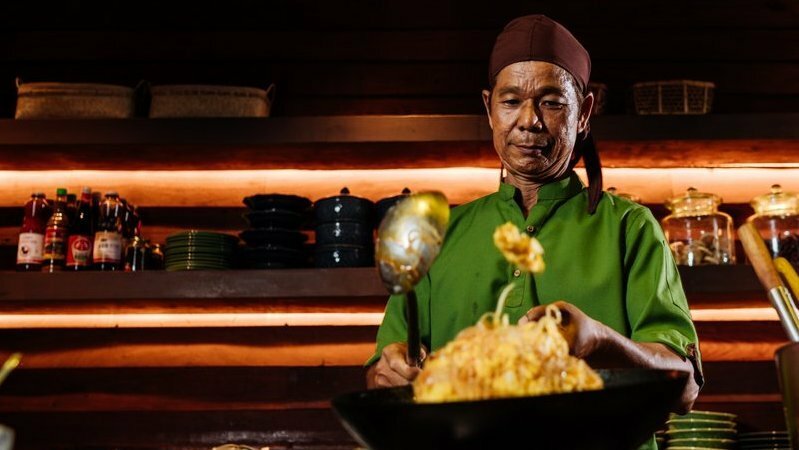 The next two dishes made it clear that Ta Khai is on a mission to introduce its guests to the wonders of southern Thai cuisine. One was Moo Hong – melt-in-the-mouth pork slow braised in an intensely rich mixture of soy, garlic and black pepper. Another was Gaeng Poo, a spicy bright-yellow curry filled with chunks of fresh crab meat and served with thin rice noodles, another iconic southern Thai dish. To add to this assortment was some more common, but no less tasty Thai dishes – prawns in tamarind sauce and deep-fried tilapia fillets stir-fried with black pepper and garlic. These too were delicious and all the dish’s perfectly balanced flavours stood testament to Uncle Nun and Aunt Yai’s finely tuned skills. We finished our incredible meal with some simple yet classic Thai deserts including bananas in sweetened coconut milk, water chestnut dumplings with jackfruit in coconut syrup, and of course, some freshly cut Phuket pineapple. 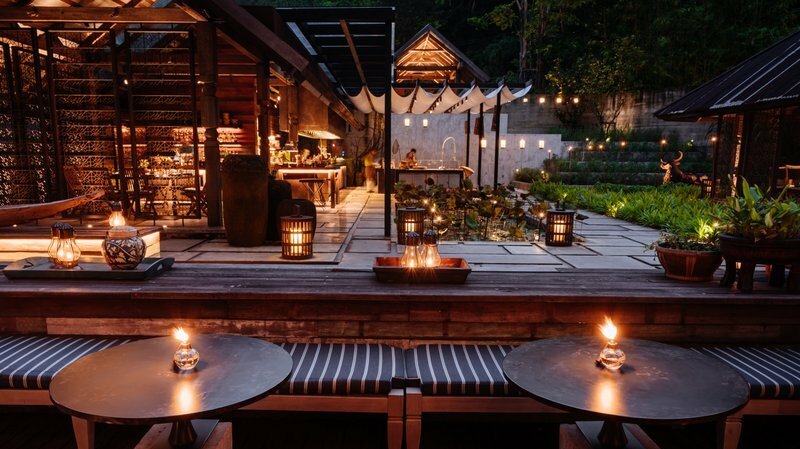 It seems Rosewood has wholeheartedly embraced Phuket with Ta Khai – it’s up there with the best showcases for southern Thai cuisine anywhere on the island. 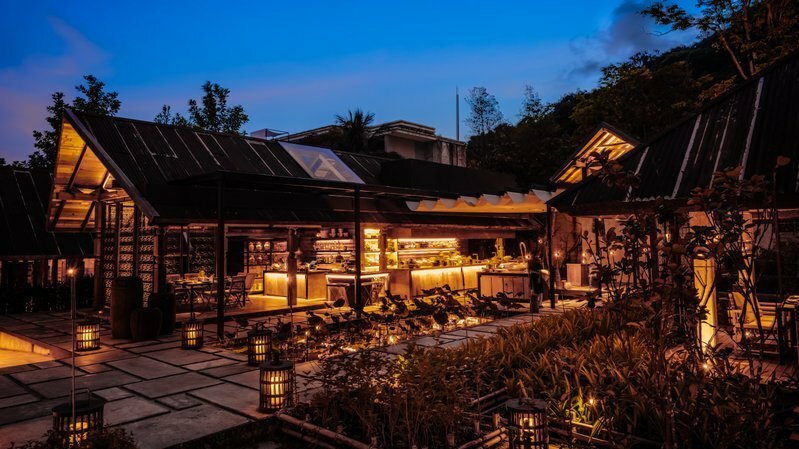 Combined with its beautiful location, lovely architecture and rustic décor, it is the perfect place for anyone who wants an authentic Phuket dining experience.